Unkie Dave, slowly disappearing until all that remains is his grin. We arrived back in London yesterday afternoon in time to head off to see wonder.land at the National Theatre. With music scored by Damon Albarn, the show tells the story of Aly, a young Londoner dealing with her parents' separation, low self-esteem and some serious bullying at school, who escapes from it all into the online world of wonder.land (pronounced "wonder dot land"). To be honest you probably could have guessed all of that though just from the terrible tag-line, "an Alice for the online generation". Despite that inauspicious build-up, I loved it. I am not a frequenter of musical theatre, for many years the Once More With Feeling episode of Buffy was the standard by which I judged any such performances (and a high bar it was too). I will admit to having a soft spot though for Baz Luhrman, even going so far as to see his staging of La Bohème on Broadway, and in fact the closest comparison I could make for wonder.land was Moulin Rouge, for it was indeed spectacular, spectacular. While the music and songs were ultimately a bit forgettable, the staging itself was just incredible, with the stage topped by a massive screen on to which (genuinely) psychedelic computer animations were projected, interacting with the live actors on the stage and creating something really unique, enhancing the actors' performances without dominating them. The integral nature of the technology extended off-stage, with a neon day-glow side-show in the lobby offering oculus rift experiences. 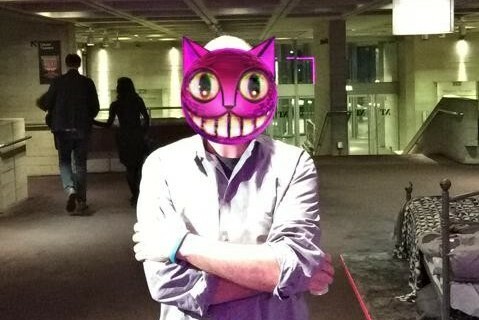 cheshire-cat selfies (as seen above), augmented reality musical games and percussive afternoon teas. I saw Mr Albarn himself and his musical chums last summer in Hyde Park, and him alone in Bristol the year before as part of his solo tour. I never saw Blur the first time around, my liking of them actually increased post-Gorillaz. I remember back when I was at Bowie's Sound & Vision tour aged 17 looking around at all the guys in the audience in their forties and just being embarrassed for them. I see that same look reflected back at me quite a lot these days. They live in a house, a very big house in the country. Making cheese and ice cream, apparently.